Over a casual lunch, I had the pleasure to interview Al Barbieri - a member of Redwood Region for well over 40 years. Al is a dentist in Santa Rosa -- still working and still enjoying his Porsches. 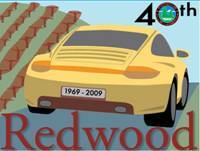 (dR) Al, how did you get involved with Porsche cars and Redwood Region? It was 1969, I was newly married and was saving for a down payment on a house when I was smitten with the new Porsche models. The down payment did not become a house, but rather a new Tangerine 912! I had wanted a Targa, but only a coupe was available. I joined Redwood Region at that time for the camaraderie, friendship and a bit of autocross. (dR) Is it true that you have more than one Porsche? Yes, in 1975 I saw a lime green 1961 356 Karmann notchback on a local street with a for sale sign in the window. It was so cheap I could not pass it up -- I bought it. Turns out that it became my primary Porsche after my wife had an autocross accident in the 912. The 356 became and still is my usual Porsche ride; the 912 was set up for concours. Oh, but there is another half Porsche! I have half interest in a 2006 Boxster co-owned with my daughter and her husband -- and I do drive it often. So I am the owner of two and a half Porsches. (dR) What was Redwood like in the 70's and 80's? It was a very social and fun group. We of course had parties, tours, autocrosses, BBQs, rallyes and track events. But primarily the car served as a social outlet. We made great friends, had good times and supported each other. We even worked on each other's cars helping keep costs down. Back in those days, when the Cotati Racetrack still existed, the late Emmett Wilder taught us how to really drive our Porsches. But everything was just for fun -- no fancy stuff, just good friendly people. (dR) Care to share some of the great stories? At my first Parade, in Monterey, I was the guy who pushed Dr. Porsche. I was placing cars for concours and this old fellow was in my way. Later I learned who he was and that I had earned the "DummKopff Award" for my diligence. On a Mendocino trip we stole room keys and short sheeted each others' beds. Being of Italian ancestry, I really liked the "Italian Parties". You had to be Italian to come, or you could just bring something Italian like a string of garlic! Then there was the "here today, gone tomorrow winery". We would set up an impromptu "winery" along the tour route to a real winery. It was set up a few minutes before the first arrivals and dismantled immediately afterwards. So for about 20 minutes cheap wine was served with a ladle into a paper cup, sometimes from a toilet bowl! (dR) How about driving-oriented events? In addition to those events we already talked about, one stands out in my mind. On the way to Parade in Snowmass, we had a couple of people in new 930 Turbos and they wanted to see how fast they could go. Emmett hit 156 and the other 155 -- it was quite a show. (dR) What activities would you like to see brought back? Weekend tours, BBQs and Pool Parties. (dR) Thanks Al for the wonderful remembrances. The Region celebrated its 40th anniversary on July 25, 2009.